Whisk together olive oil and balsamic vinegar. Brush both sides of mushroom and red pepper pieces with oil mixture. Arrange mushroom and red pepper pieces on baking pan and sprinkle with sea salt and ground pepper. Bake in a 400 degree oven for 30 minutes. Remove from oven and let rest for 5 minutes. While mushrooms and peppers are cooking, mix Seasoned Olive Oil ingredients. When you remove veggies from oven to rest, toast bread and then brush one side of each slice with Seasoned Olive Oil. 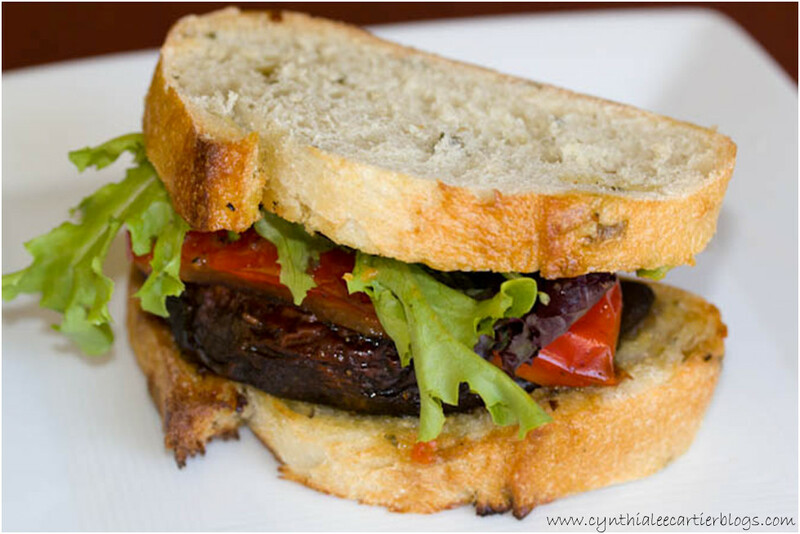 Assemble sandwiches by placing one of the portobellos on each slice of oil-brushed toast, then a red pepper slice, then lettuce. Brush the top piece of toast with a tablespoon of the Tomato Basil Sauce. Serve immediately.